Now that I will be without them for the next four months, I cling to my cookbooks. The big kitchen remodel starts Monday, and the books are all going in boxes today. But I delay their banishment, flipping through pages and contemplating recipes. There's nothing wrong with our current kitchen. It is big enough (just) and serviceable. It is just shabby and tired and its little inconveniences annoy us – like exhaust fan install backwards so it blows into the room instead of sucking the air out. And it is dark, with only two little windows and prime window space hidden behind a mudroom and an inconveniently located powder room. It is all going away on Monday. The demolition crew shows up bright and early, no doubt as I am brewing my last pot of tea in the old kitchen. We'll be camping out in the dining room for the months to come with a refrigerator and a microwave, but no running water. And when we move into the new kitchen this summer my favorite new feature will be double the book shelf space so all my cookbook collection can be right there with me. I hope that your building work goes well and speedily, I know just what you will be going through over the coming weeks and I don't envy you one little bit! We had an extension built to our kitchen a few years ago now, to have the addition of a utility room and whilst there is no way that I regret having the work done, there is no way that I would want to go through it all again! I have to admit that I am not much of a cook any more, it is definitely more of a chore than a labour of love! We try not to eat cake, desserts, or biscuits, so sweet things are really off the menu for us. I just like to look (drool!) at the pictures in my sister-in-law's cook books and maybe even sample some of her cakes and desserts, if we happen to visit when she has had a big bake out!! 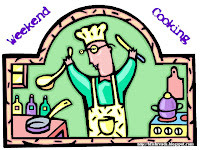 Enjoy your last weekend of kitchen bliss! Living through a renovation can be a pain, but it's so worth it when the work is done. I'm excited for you! Oh,no, four months of camping! Hope you get a lot of great takeout and that it'll all be worth it in the end! Good luck with the remodeling, Gilion! I'm sure it will be worth the wait when you can cook in your new kitchen. been there, done that..and while it was not huge fun the gain was outstanding and totally worth it. Best of luck with the remodel. It will be tough, but so rewarding when it it is done. Four months without a kitchen sounds tough, but then, I'm sure your new kitchen is going to be worth it. Maybe it's time to explore the take-outs in your area? Good luck! Oh wow! I hope you keep us updated on the progress. And lucky you to have space for your cookbooks right in the kitchen. It sounds like a nightmare but I'm sure it'll be worth it in the end. I hope you can show us before and after photos! Take plenty of before-and-after pictures, as well as updates as the work progresses. Our kitchen redo was definitely worth the inconvenience, and I imagine yours will be too. Good luck! Renovations are such a hassle, but always worth it in the end. I hope you'll post before/after photos, and maybe even keep us updated along the way, too. Oh, so envious! I don't envy living through a renovation but oh, the end result! Ooooh, how exciting for you!